Hello! Today I have April's Nailbox unboxing for you. I wasn't massively impressed with last months box (post here), so was hoping for something a bit more exciting this month. This month is Nailbox's first anniversary so I had high hopes. Here is everything included. Read on to find out more about each item! The first polish I picked out was Ciate 'London Baby', a topper full of what looks like black and holographic glitter. I have quite a big collection of Ciate polishes and surprisingly don't have this one! This is easily my favourite item this month. Next up is Invogue 'Sugar Daddy', a hot pink creme. This is the fourth polish within 3 months from the same brand (Invogue/Eye Candy London), and they don't have the best reviews. I do love pink so will give it a try, but see a lot of subscribers being unhappy with this. The last polish is Bourjois 'Bleu Asphalte'. I'm not too sure how I'd describe this colour - a slightly purple smokey grey? It's not normally a colour I'd go for, especially for spring, but I will give it a go and see what I think. We also received an Elegant Touch 'Nail Quencher' moisturising base coat, which claims to reduce peeling and splitting. In the time I've been subscribed, this is at least the 3rd Elegant Touch base coat to be featured. I do get some splits from dryness during winter so will probably keep this until then. The last item this month was a packet of 'Pre-glued Nail Gems', also from Elegant Touch. 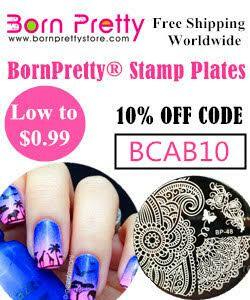 I actually think these could come in quite handy for some quick nail art. I appreciate having both gold and silver gems in the same pack. What do you think this month? Sadly, I'm not really feeling it - again. 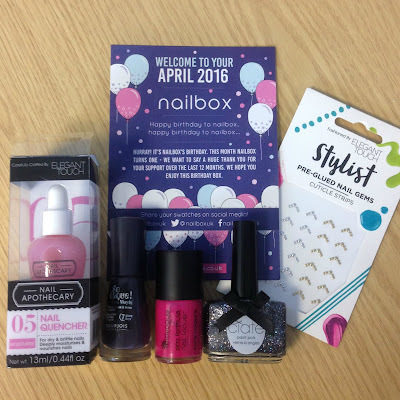 I was hoping that after the feedback on the last few boxes that nailbox would try a bit harder, especially for their birthday box. Most of the items in this box can be found online very cheaply so I don't think it was great value for money either. Unfortunately after my yearly subscription ends next month, I will probably unsubscribe. Not the most fun box I guess. It's nothing wrong with colors of the polishes but not anything really exiting either. You're right. The stuff they included in this box just looks like stuff you couple pick up at any store in throw into a box. The Ciate polish is nice, but everything else is pretty boring and not special.